With Floam in your hands the fun never stops. 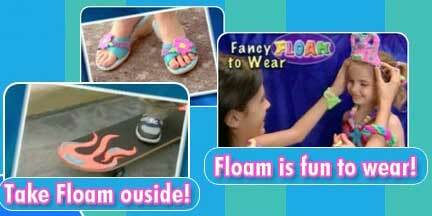 Kids Love Floam because with Floam in your hands the fun never stops. And for only 19.95 plus shipping and handling each order includes 3 large tubs of Floam in florescent red, blue, and yellow! And as a special bonus today we’ll double the size of your Floam tubs, plus we’ll even throw in a jumbo size tub of green and the step by step Floam model making guide absolutely free! 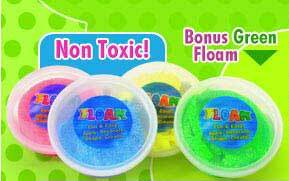 Floam’s made of special, tiny micro beads that stick to one another to form anything you want. It’s safe, non toxic, and can be used over and over again. Floam sticks to most anything for decoration but can be easily removed if desired. You can mix colors of Floam together to create a rainbow of colors. There’s nothing like it. Floam turns fun into works of art.